Cheyanna Phelps is currently a junior at Valley Center High. She is thrilled to be part of the 2014-15 leadership as the VP and President of Publicity. While a lot of her time and pursuit is towards athletics, her passion lies with the performing arts. Cheyanna has many ideas for the Drama Club in the near future and is looking forward to working with the members as well as her leadership team. Kelly Ryback is the Treasurer for Drama Club, she is a sophomore and is 15 years old. Kelly has performed in 3 plays and 1 musical and also has performed in acting competitions. In her free time, she enjoys writing, reading, hiking, riding her horses and being with friends. She would like to wish everyone a great year and hopes to see everyone at the next Drama Club meeting, activity or competition! Isabel is a junior this year at Valley Center High School. She is very excited to make this year in Drama as exciting as possible. Isabel has many ideas for this year including bringing back the masquerade ball, Improv vs. Sports Teams, and making meetings more entertaining. Her freshman year she assistant directed the spring production of See How They Run. She has been in nine productions, and her favorite part was Cosette in Les Miserables. As the oldest of six children, I was handed the responsibility of tutoring m five siblings at an early age. I first became fascinated with language when, bedridden with asthma, I listened transfixed to the descriptions of New York Mets sportscaster, who translated a simple baseball game into a titanic struggle between hometown (hapless) heroes and invaders from places like Philadelphia and St. Louis. A middle school teacher took her students to see a Broadway play (for most of us, our very first). In the middle of a torrential New York rainstorm we watched a play set in a southern afternoon. I was transformed. From then I hooked on literature and drama. The family traveled the country; I fell in love with San Diego and came back for college. Southwestern College preceded San Diego State, and later United States International University. I've had the great pleasure to teach students in Valleycenter for exactly three decades this year. Tania, my wife is the jewel of my existence, while Peter, our son, is a professor at Plan of College, and Meghan,our daughter is a health account manager. And my chief goal continues be inspire my students to be greater love of language. Yeats said it best: " Education is not the filling of a bucket; it is the lighting of a fire." Kelsey Rocha is a senior at Valley Center High School. One of her greatest passions and favorite hobbies is participating in the performing arts. Though she doesn't plan to pursue it professionally in the future, she plans to always keep acting as a hobby. Some of the shows that Kelsey has been in are "Bang! Bang! You're Dead. ", "Check Please!" and "Back to the 80s". Her favorite role that she has portrayed is Emily in "Bang! Bang! You're Dead!" because it was one of the most difficult. That role, and show as a whole, was a life altering experience for Kelsey. As Vice President of the Drama Club, Kelsey considers herself to be very involved in the drama program at Valley Center High School. Other hobbies of Kelsey's photography, hiking, and swimming. Alexandra Baum is incredibly passionate about drama and acting. She has been acting for her whole life, no matter if she was on or off of the stage. She has been in about 35 performances. She hopes that her future will be filled with performing. She would like to attend a performing arts college, ideally somewhere in L.A. Or N.Y. Alexandra hopes that she can spread the love that she feels for drama, to anyone and everyone that she can. Thank you! Caitlin Appolito is very excited to be this years president for drama leadership. Last year she was the secretary of Valley Center Drama and she can't wait for a new and better year. 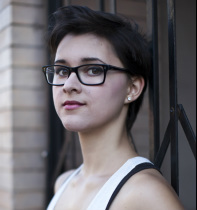 Caitlin is a junior at Valley Center High School where she takes part in the drama class and the improvisation team. Caitlin has been acting for a few years and has been in seven plays including "Mulan," "Beauty and the Beast," "Once Upon a Mattress," "Honk," "Check Please! ", "Bang Bang You're Dead. ", and "See How They Run." Her hobbies include reading, writing, singing, and dancing, but her passion is acting. In her future she hopes to attend a performing arts college in New York, start a career as a professional actress, and never stop acting. Kyle has been in the performing arts since he was in the fourth grade. He first started out playing the violin and then moved onto the theatrical side of performing. These are some of his plays and performances he has done: "Guys and Dolls" (Nathan Detroit), "Grease" (Johnny Casino), "A Midsummer Night's Dream" (Lysander), "Odd Couple: Female Version" (Jesus Costazuela), "Back to the 80s" (Corey Palmer Jr.), and got booked for a Kyocera/Sprint Commercial back in March 2011. He is currently signed with Avalon Artists Group in Los Angeles and Elegance Talent Agency and Model Management in San Diego, CA. In April 2011, he attended a Proscout event and received seven callbacks from Los Angeles agents and managers which then led to his signing with Avalon Artists Group. At VCHS, he was crowned 1st place Jag Idol (Singing Competition) winner of 2011 and went on to compete in the North County Idol. He also is involved in high school drama, musical theatre, choir, jazz choir, and dance. He is currently auditioning for numerous roles in projects for TV Shows, National Commercials and more. Some of his favorite hobbies include singing, wake-boarding, swimming, and camping. He is thrilled to be this year's Drama President. Mindy Dee Paul has been in the performing arts since her eighth grade year, playing Arvide Abernathy in Guys and Dolls (VCMS theatre) and Tweedledee in Alice in Wonderland (VCCT Theatre). Now as a senior, she has a few more shows under her belt and cannot wait to end her last year at Valley Center High School with a bang! Previous performances include: Helena in Shakespeare's, "A Midsummer Night's Dream," Olive Madison in Neil Simon's, "Odd Couple: Female Version," Donna, the Psychic, and Melanie in "Check Please!" and multiple Improvisation performances and local modeling runway shows. Last year, Mindy also went to finals at the Role About Theatre Competition for her performance of a monologue from the film "Garden State." The 2012-2013 school year will be her third year as captain of Valley Center High School's Improvisation team The Comedy Zombies, and her first year as a part of the Leadership team! Mindy's goals are to become a successful actress and model, go to school in the amazing, exciting New York City (Fordham University, Marymount Manhattan, or NYU) to continue expanding her knowledge and talents in the arts, and take every opportunity life throws at her. Some hobbies of hers are singing, listening to her favorite band: Bright Eyes, reading, attempting to dance swimming, and hiking. She is ecstatic to be working with Kyle Kittredge, Cailtin Appolito, and Nicole Padgett in making this year a year Drama will never forget!